To Kantor Muth and her numerous musicians who made this holy week and Easter redound to the glory of God! I have no idea how on earth she could possibly pull it all off. 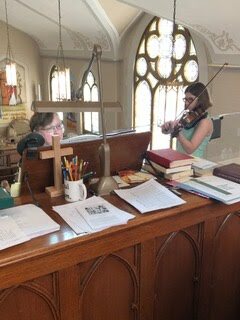 To top it off, when Distribution ran long at the Easter Divine Service, she ran over to the corner, pulled out her handy Orgelbüchlein and gave us Bach's "Christ Lag in Todesbanden" BWV 625 off the cuff. Amazing. We had cello, viola and violin, timpani and trumpet, bells and organ, and of course much choral music. "Instruments, waken!" indeed. Could we find better words to pray as the sun begins to westering and we know the joy about to break forth? Lord God, we praise You; Lord God, we thank You that You have granted us to see the holy day of Easter in peace and good health. Most especially we glorify You for giving us the victory over all our enemies by the resurrection of Jesus Christ, Your beloved Son. O Lord Jesus, we thank You for Your triumphant resurrection from death by which You opened heaven to us, destroyed death, and obtained for us the comfort that You are the resurrection and the life. O God the Holy Spirit, we thank You for Your paschal message, and we pray that You would plant the paschal joy in our hearts and increase and sustain it in us. And as by Your power the troubled hearts of the disciples were made glad at Easter, so comfort us with Christ's resurrection and that we have a gracious God, we shall live forever, hell and Satan have no power over us, and the world cannot hurt us. O Holy Trinity, God the Father, God the Son, and Holy Spirit, sustain Your Church against all her enemies, spiritual and physical. 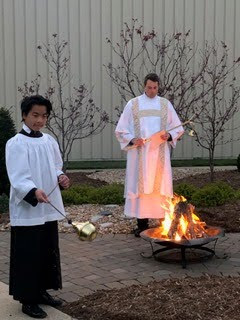 Grant that after this life we may all keep the joyful feast of Easter in Your life of gladness, and with all the angels praise, extol, and glorify You, most blessed forever. Amen. This holy Lententide to spend some extra time in the Word and prayer. 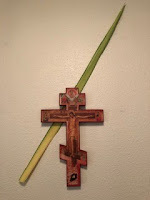 Lent calls for us to do this, for we have no strength in ourselves to live as God's children in a way that pleases Him. Our strength always comes from the Word and from invoking God. And when we do, our own frailty and struggle become no cause for despair, but rather in our weakness we learn to stand in awe at the strength God supplies that we know is not our own. 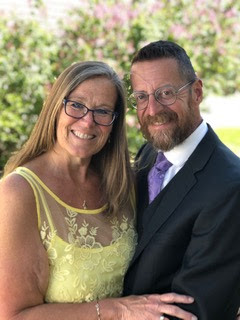 Cindi and I always start the day with Treasury of Daily Prayer, so again this Lent we've read through large swaths of Genesis and are now in Exodus; we've also read St. Mark and are in the midst of Hebrews. I added in for myself the Lamentations during Holy Week (optional reading in Treasury). During my commute, I finished up listening through the Scriptures on Audible right after Ash Wednesday (started a few weeks before PreLent). That is an experience by itself: listening to the Bible (rather than reading). 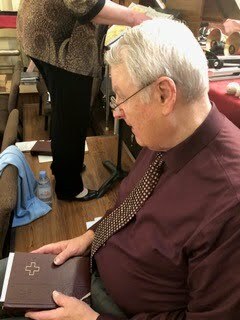 This Lent I've tried to be faithful in praying the Psalms according to the monthly pattern laid out in the Book of Common Prayer (and provided also in our Concordia Psalter and Treasury). I've written that division into my Bible and I just turn there and pray them, morning and evening. Then during the days of Lent, I've also added after the morning psalms a reading from whatever chapter in Proverbs corresponds to the number of the day of the month we're on. And it has been odd how that chapter turns almost instinctively from instruction to supplication! And then there is the marvel of Lutheran Prayer Companion! I've found myself relying on it every day for the Morning and Evening Benedictions and for the wonderful daily prayers on the petitions of the Our Father by Habermann (usually pray those in the morning). I love, for instance, how we pray for our pastor on Sunday in the "Hallowed be Thy name" petition: "O God, on this Sunday make my dear pastor as well as other faithful teachers and preachers, vessels of Your mercy and instruments of Your grace, and let their ministry attain to the praise of Your glory and to the welfare and blessedness of every soul entrusted to their care." I love the way we beg God the Holy Spirit to grant us grace that our last meal in this life may be the Holy Supper, the last image in our mind Christ crucified, and the last words on our lips "Father, into Your hands I commit my spirit." Preparation for Communion now invariably includes prayers from this wonderful volume. And I've tried to form a habit (only partially successful this Lent) Schmemann once recommended: offering the prayers for thanksgiving and for the fruit of the Sacrament for the three after I receive; and then prayers of preparation to receive on the three or four days before I receive again. Then there is the confession of sins in this the Lutheran Prayer Companion. It beggars belief in its brutal honesty, covering every base, the law having done its deep cutting work, no excuses, so extenuations, just naked owning up to the mess. And that's just a teasing taste! So many times throughout the day, I find myself taking this volume in hand to pray for various needs that arise. It's so helpful that I have my physical copy at home but also carry it in my iPhone and iPad. It's been quite transformative and I cannot recommend this prayer book highly enough (just one of the many gems of Lutheran spirituality Matthew Carver has given in English). The extra time in the Word and prayer has stirred a greater hunger for more of both than I think I've remembered in my life since the days when I was a teen and it was all so new to me. I really hesitated to post this; I know it can sound pitifully prideful. But I risk offering it in the hopes that it will not be received that way, but will rather reflect on what an absolute joy this Lentide has been for this poor, miserable sinner through these two gifts of God's grace: His Word and prayer. Dessert: Homemade Vanilla Ice-cream (made with homemade vanilla too! ); Baklava; assorted Dark Chocolate; Limoncello and pour-over Coffee. We did a similar meal last Easter and it proved so popular with the family, we decided to stick with it. Only thing missing this year was the spanakopita, but we subbed in Greek Shrimp instead. And tomorrow, we'll be doing double duty: a delayed birthday celebration for Cindi (who doesn't even have to give a thought to clean up) and of course the great celebration of our Lord's Pascha (which commences tonight with the Great Vigil at 8; continues tomorrow with Easter Matins at 6:30; and reaches its culmination at 9 with the Divine Service for Easter Day). Just got back a few moments ago from our parish's Tenebrae Vespers. A solemn praying of four Psalms (spoken) 22, 2, 27, 51. 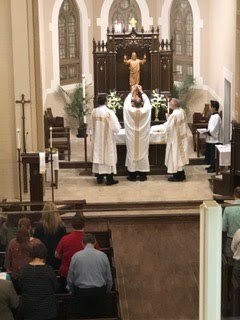 Then the singing of "O Sacred Head" (Bach setting; but four stanzas) leading into the Passion of Our Lord Jesus Christ, According to the Holy Evangelist St. John (Schalk). David, as usual, did his bang up job on the Evangelista and the choir did a lovely job on the the cries of the crowd. Kudos to Kantor Muth for pulling it off! Responsory and then "A Lamb Goes Uncomplaining Forth." 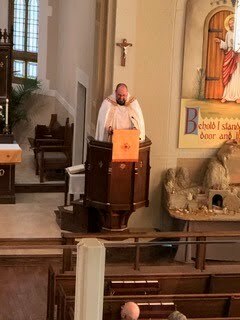 Pastor preached a comforting homily "It Is Finished!" And then we concluded briefly with Kyrie, Our Father, and three collects. The sounding of the strepitus and then we left in silence, but not quite dark. Easter is so late this year there was even a touch of light in the sky. Earlier, Cindi and I had taken Lydia, Henry and Oliver to the Chief Service, where they were good as gold for us. The Chief Service is longer and filled with some moments of silence, but they made hardly a peep. That liturgy begins unusually (though the way the ancient liturgy DID begin) with simply a collect and then the reading commences. Also unusual that a collect follows the first reading (Isaiah 53) and the second (2 Corinthians 5). 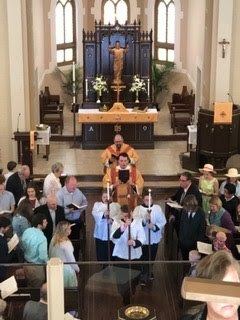 Then we sang the first stanza of "Jesus, I Will Ponder" and proceeded to do just that: ponder His Passion as the St. John passion was read, interspersed with the singing of seven stanzas of the rhythmical version of "O Sacred Head." Sermon, then Fortunatus' "Sing My Tongue." 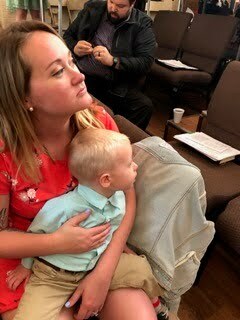 The bidding prayer followed and I was delighted to hear grandson Henry chiming in on the Our Father at the end. 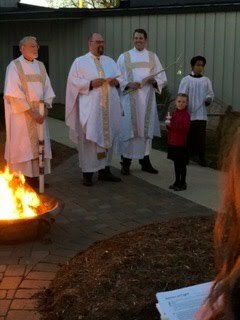 Then the adoration of the cross with the reproaches (the school children sang the response to the pastor and we joined in the "Lamb of God" after each). 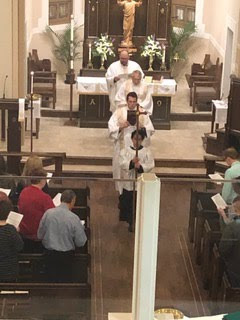 They sang the last canticle: "We adore You, O Christ, and we bless You, for by the wood of Your Cross You have brought joy into all the world" as the altar was readied for the Sacrament. Unlike our Roman brothers and sisters, our rite calls not for administration of the pre-sanctified carried from the altar of repose, but for an abbreviated communion rite. So we proceeded from Preface to Our Father to Verba and then Distribution. After the school children communed they sang a lovely Hildebrand setting of "God So Loved the World." Otherwise the Distribution was in silence. A collect after the Distribution and then "The Royal Banners" was sung and we left. 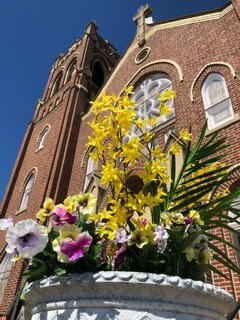 Only one more service to go for this year's joyous Triduum, the Great Vigil of Easter tomorrow. It will not start until 8 p.m. Our pastor (as I have noted before) is no trimmer. 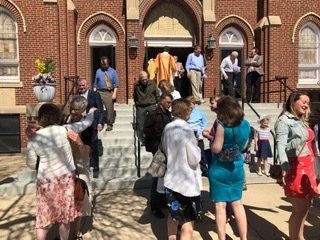 The whole provision for the rite will be done, and the service will stretch into the evening with its 12 Old Testament Readings; an epistle reading connected with the Baptismal Remembrance; the Easter Litany, and then the Easter Gospel and the Easter Homily of St. John Chrysostom and then the Sacrament celebrated. Just thinking about it, brings such joy! The tilt happens tonight. From here on out we're pressing toward the Descent into Hell, the Resurrection, and the Joy that cannot never be taken from us. Who is this that hangs upon the Tree? St. Luke is at pains to make us understand that this is the King. Before His passion began, He had told His disciples at the meal "I assign to you as my Father assigned to me, a kingdom, that you may eat and drink at my table in my kingdom." Pilate asked: "Are you the King of the Jews?" The inscription posted above His head as He hung upon His cross announced to any who looked: "This is the King of the Jews." And in the face of this Crucified King, you can go one of two ways when your final hour comes. You can either rail at him as the thief on one side did: "Are you not the Christ? Save yourself and us!" For what good, such a man thinks, is such a King, a Christ who lets you die? Useless! Who needs a King like that! Or, in contrast, with the eyes of faith, you can stand with the other thief. Had he read the inscription above our Lord's head? Beholding the Crucified in awe, he rebukes his fellow thief with the words: "Do you not fear God, since you are under the same sentence of condemnation?" A deliciously ambiguous statement, by the way. Since you are under the same sentence of condemnation as....this man or as God? YES! "And we indeed justly, for we are receiving the due reward of our deeds; but this man has done nothing wrong." There's the crux. We have no right to complain of death (and it arrives to us in countless little foretastes before it finally squeezes out our last breath). Our deeds demand it all. "The wage sin pays," says St. Paul, "is death." Serve sin and that's the result. And you have, haven't you? I have. But this man, this man hanging here between the two, between the one who rails at death and the one who admits it is the just due for our sin, this King of the Jews, well, "this man has done nothing wrong." Which means He doesn't belong here. Suffering and dying. Three times Pilate told the truth: I did not find this man guilty. I have found in him no guilt deserving death. That was profoundly true beyond anything Pilate ever imagined. And yet he consigns Him to the will of the people and so hands over the Innocent One to suffer right along with the guilty. And this was God's plan and purpose all along. "It was the will of the Lord to crush Him" as Isaiah said. Behold, the King of the Jews. Again Isaiah: He pours out His soul to death and is numbered with the transgressors. Thief, King, Thief. And yet this other thief, knowing that King Jesus is innocent, knowing that he himself is only getting the punishment that he has deserved, dares to turn his eyes and prayer to the King on his wooden throne and beg: "Jesus, remember me when you come into your kingdom." And He answers: "Today, you will be with me in paradise." Paradise. Before the Innocent Sufferer, the flaming sword withdraws and the gate swings open wide. Paradise. One only enters it with Him, "with Me" as He said. This beautiful word from His cross was not just for that thief, but for you too. It was for all who turn to their eyes to the King who is establishing His kingdom by His suffering and death, to all who gaze upon the Innocent Suffer in awe at His love in choosing to be there for us. It is for all who in their final hours pray to this King who dares to join us in our misery: "Jesus, remember me, when you come into your kingdom." His answer to such a prayer stands forever: "Today you shall be with me in paradise." A King giving out a lordly gift indeed. "You will eat and drink with me in my Kingdom." A promise to cling to as the darkness grew, as the temple veil tore, as he places His spirit into His Father's hands and breathes his last, as the verdict is heard once more, and again from a Roman, this time the centurion proclaiming: "Certainly this man was innocent." And it is as the innocent sufferer that His Father vindicates Him, and and in Him, you. His innocence is what He dies to give to you; it's how He gives the kingdom. "Not by gold or silver, but by His holy precious blood and innocent suffering and death, that I may be His own, and live under Him in His kingdom, and serve Him in everlasting righteousness, innocence and blessedness." And as a Joseph welcomed Him into his arms at the beginning of the Gospel and carried Him from the womb when He could not carry Himself, so a Joseph welcomes him into his arms at the end of the Gospel and carries Him to a tomb. Joseph of Arimathea, about whom we are told: "and he was looking for the kingdom fo God." So He takes the body of his King into his arms and carries him to the new tomb. And then together he and the women cease their work as sun sets, as Sabbath arrives. Where Jesus, there the Kingdom. Where Jesus, there your King. In your suffering, in your dying, He will not be far away. He, the Innocent One, has been there for you that He may always be there for you. Never cease turning to your King and praying: "Jesus, remember me." Hear and hold His promise: "Today. With me. Paradise. You." Then you too will be able to die with Your king in peace, whispering: "Father, into your hands I commend my spirit." And you will enjoy your own little Sabbath rest until the day of Resurrection, the Final Easter dawns, the Easter day that will have no end. O dearest Jesus, what must you have experienced when your own people demanded: "Away with this man, and release for us Barabbas"? When to Pilate's desire to release You, they began a raucous chorus of: "Crucify, crucify him!" And when the longer Pilate persisted in trying to free You, the louder grew their demands for Your death? Truly did Your Apostle write: "He came to His own and His own received Him not." As Pilate caved to their demand, he delivered You over to their will. And that will was to destroy You, You who had done so many acts of kindness and love toward our fallen race even before the days of Your flesh, but how much more afterwards. And Barabbas? Oh, Jesus, we may not pass him by. They demand the son of a father, for so his name runs, be released and You, THE Son of THE heavenly Father, to be slain. Oh, Jesus. A rebel and a murderer was he. A true son of Adam, then. We cannot avoid seeing it: we are Barabbas, are we not? Sons of the man of dust and destined to the dust, rebels in our fightings against Your Father and His will, and murderers not just of one another, but, yes, of You. And You willing tender Your life for our own. You WANT Barabbas to be free. Love divine, all loves excelling. And Simon unexpectedly getting to carry Your cross. Were you too weak then? Had the beatings of the night before by the soldiers taken their toll? The women with their mourning and lamenting. We want to join them. We want to cry out over this terrible thing unfolding before our eyes, but You forbid it. You don't want us to weep for you. You want us to weep for ourselves and our children. You, who set Your face like flint to go to Jerusalem knew exactly what it meant; You, who accepted in the Garden the cup that Your Father poured for You; You want no pity whatsoever for the doing of Your Father's good and gracious will. You want us to weep instead for the judgments that await those who refuse that will, who will be dry wood kindled by the fire. And even as You head into Your passion, Your mind is so filled with the words of the Prophets that Hosea comes tumbling from your lips. How those who shun Your sacrifice will on that Day of Yahweh's glory find no refuge in the earth, no place to hide, no cave deep enough, not though they were buried beneath the mountains. Weep, You tell the daughters of Jerusalem, for that, but not for You. You are moments away from Your glory, from providing the only refuge that will find hide from the true wrath of God. Your most holy cross. And so the three condemned men arrive at the Skull, the Cranium, for You had comes to deal with death once and for all, had You not? Long before Your prophet Isaiah had foretold how You would be numbered with the transgressors, and so here You are crucified. Nailed to the dry wood and hoisted with them on either side. And as the nails are driven and You are lifted high, You again fulfill holy Isaiah. "He bore the sins of many, and makes intercession for the transgressors." Oh, Jesus, how sweet is that present tense at the end: not just that You did it then, but that Your sacrifice, Your oblation does this for us forever—a never ending plea for mercy before the Throne of Your Father: "Father, forgive them, for they know not what they do." As the soldiers gamble for your garments, Psalm 22 opens before our eyes: They have pierced my hands and feet, I can count all my bones, they stare and gloat over me; they divide my garments among them and for my clothing they cast lots. And how oblivious those for whom You sacrifice Yourself in such love. "He saved others; let him save himself if he is the Christ of God, His Chosen One." So the rulers, and the soldiers join their mockery with the sour wine: "If You are the King of the Jews, save yourself!" Oh, dearest Jesus, how blind we are by nature! How we miss what is right before our eyes! It was to save others that You would not come down from the Tree; it was to save them, and us. You showed Yourself the Christ of God and His chosen One and Israel's king precisely by refusing to save Yourself, so intent were You on saving us and all for whom You prayed. This is love to the end. When You stood before Pilate and he asked: "Are You the king of the Jews?" You had only answered: "You say so." And indeed he did say so by the inscription he posted above Your sacred head, now wounded: "this is the King of the Jews." Oh, dearest Jesus, our Jesus, thank You for letting us dwell here at Your cross this hour. Thank You for opening our eyes in awe by Your Spirit to see Your determination that we be saved and set free, we poor children of Adam, we Barabbases. Thank You for teaching us to sorrow over our sins, but to glory in Your suffering and Your cross as the most joyous and wondrous gift we could ever receive. Thank You for Your sacrifice pleading to the ages for our forgiveness, our salvation. Thank You for being such a King and welcoming us into such a kingdom. We adore You, O Christ, and we bless You for by Your holy cross You have redeemed the world.